First of all: Why ask this question? Surely there are more traditional ways to manage sleep disorders, as well as more established ways to make use of assistance, service or therapy animals. However, the idea of animals being utilized in the treatment of illnesses such as sleep apnea or narcolepsy is not as unusual as you might think—especially in the US, where both sleep deprived people and pet owners are in abundance. According to the CDC, one in three adults in the US don’t get enough sleep. Even more alarming is that an estimated 50 to 70 million American adults suffer from sleep disorders! Now, consider the following pet owner numbers while keeping the aforementioned CDC statistics in mind: Almost 70% of all American households include one or more pets; and over 40% of these households are the homes of dogs. Because pups can also be trained to assist people, they can be found in work settings, too: from farms and hospitals; to police stations, fire departments, military installations, and more. While we can’t be sure of the exact overlap in these numbers, it’s a pretty safe assumption that there are more than a few people in the US suffering from sleep troubles that also happen to be pet friendly. With this in mind, it just makes sense to look into the viability of using animals—as therapy aids and more—to make life a little easier for people with sleep problems. Simply put, animal-assisted therapy is just what it sounds like: A way to improve emotional, mental, physical and/or social functioning through guided therapy that is supported by animals. For example: Dolphin-assisted therapy usually involves having patients with mental and/or physical disabilities touch or even swim with dolphins in a controlled environment for a finite time period. This is similar to equine-assisted therapy programs; which may involve therapeutic horseback riding, horsemanship lessons, and even stable management. Conversely, animal-assisted therapy for some patients may be as simple as being visited regularly by handlers with therapy animals like cats, guinea pigs and rabbits. These handlers and animals aren’t just pet owners and their furry friends volunteering on a whim; for instance, therapy dogs and their handlers are trained and certified by specific organizations to provide comfort and affection to patients in hospitals, nursing homes, schools, and the like. Here’s where it gets a little confusing. Most therapy animals are owned by handlers, and are rarely taken care of by people that actually need them. In cases where a person with a verifiable mental or psychiatric disability requires the constant therapeutic benefit of having an animal around, they may choose to take care of an emotional support animal (ESA) themselves. ESAs—usually cats or dogs—fall somewhere between personal pets and service animals. They need no specialized training or certification, just documentation of their therapeutic use provided by a medical professional. ESAs are covered by the Fair Housing Amendments Acts of 1988 (FHA). This means that while ESAs may not be welcome in some public areas, there are grounds for them to be allowed in dwellings that enforce a “no pets” rules; and often they are accommodated by transportation services, such as airlines. Service animals are different from both therapy animals and emotional support animals. Not only do they need to undergo training from specific organizations, but they are also comparatively expensive. Training fees can go up to $25,000! Another distinction is that, barring a few exceptions, service animals are for the most part dogs. They are recognized by the Americans with Disabilities Act (ADA), and must be permitted by law to remain with their owners in public areas. Mobility support dogs, seizure assistance dogs, severe allergy alert dogs, visual assistance dogs, and other similarly specialty-trained dogs fall under this category. How Can Animals Help People with Sleep Problems? It may almost be a reflex action for sleep experts and specialists to advise against pets being in the bedroom, due to all the usual, seemingly common sense reasons: cleanliness and noise issues, motion transfer on the bed should your furry friend hop on the mattress in your sleep; or even just the fact that a pet in your sleep sanctuary will distract you and possibly push back sleep onset, and may be the cause of waking up earlier than you should. These are valid concerns! 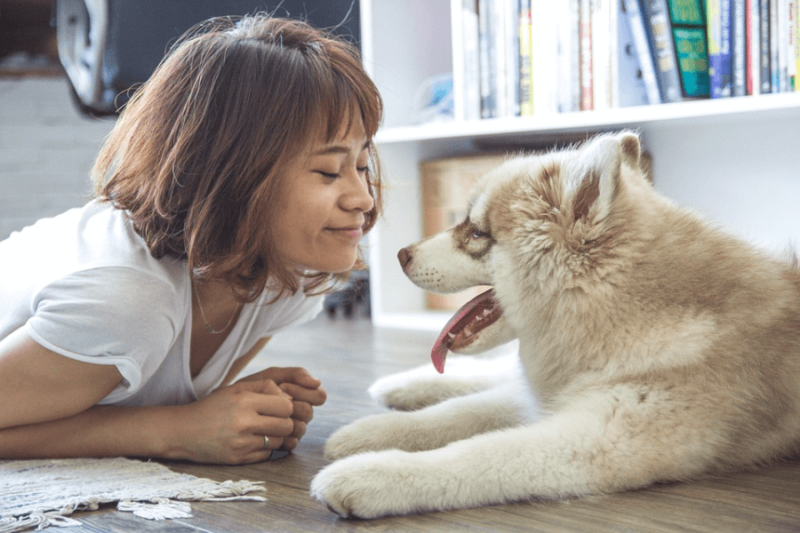 But a personal pet can be very different from an ESA or a trained service animal, and sleep health professionals should take that into consideration. When it comes to therapy animals, there is no apparent conflict—as these furry friends rarely stay with patients while they sleep. Small doses of comfort can be relaxing and overall a positive experience, and this can help people with stress, anxiety, or diseases like Alzheimer’s that may be affecting their sleep patterns. ESAs are a little different; while not considered simple pets, they are invariably long term companion animals. This means that co-sleeping may be an issue. However, ESAs are usually needed by people with moderate to severe mental health issues—which often affect sleep health. 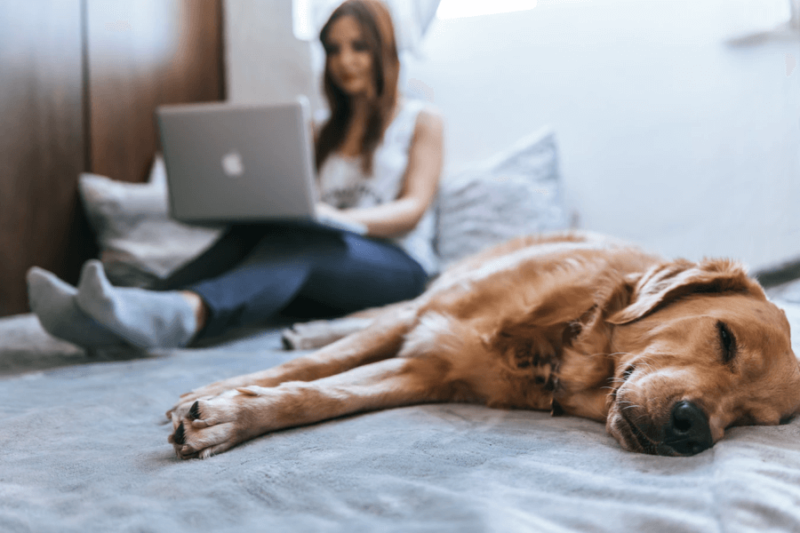 It may take a medical professional or a sleep specialist to properly weigh the benefits of an ESA against the hazards of keeping a pet in the bedroom. It’s really service dogs helping people with sleep disorders that offer a little bit more of an empirical, if not well-documented, perspective. There is currently no universal training regimen, list of requirements, or registry for service dogs that assist people with sleep disorders like sleep apnea, night terrors, narcolepsy and somnambulism; but formally trained service dogs of this nature have been reported. For example, people with severe chronic nightmares or debilitating night terrors may find comfort in co-sleeping with a trained service dog that may also be able to wake them if they start to display overt anxiety and fitfulness. 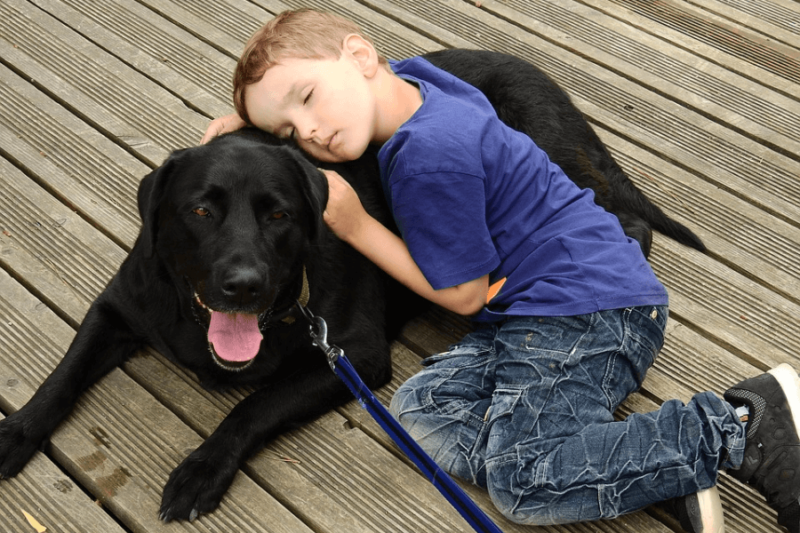 In narcolepsy cases, a service dog may be trained to do several things: wake their owner if they fall asleep in public, make sure their owner doesn’t get hurt falling on a hard surface, and even fetch medication or medical help. Many of these same actions are applicable to people that suffer from sleepwalking—having a service dog may dramatically lessen the dangers involved in suffering from the sleep disorder. Service dogs can also be trained to help people with obstructive sleep apnea (OSA); waking their owners when their breathing gets interrupted, or in severe cases of OSA, alerting them when their CPAP mask slides out of place. Animals Helping People with Sleep Disorders: Yay or Nay? Good Night’s Rest says “yay”—with a few reservations. It is our hope that the use of service dogs to manage sleep health eventually gets streamlined, as there does seem to be a market for it, as well as increasing interest. After all, ESAs can only do so much to help with sleep, especially in cases where the consequences of a sleep disorder may immediately threaten physical health. Also, the cost of trained service dogs almost necessitates that they be thought of as an option only in severe sleep disorder cases. Bottom line: If having an animal around objectively helps you sleep better, go for it.